The aim of the VSimRTI project is to make the preparation and execution of simulations as easy as possible for the users. Therefore, a comprehensive framework for simulator integration was created that facilitates the simulation of Smart Mobility scenarios. All simulator management tasks, such as synchronization, interaction and lifecycle management are handled completely by VSimRTI. Several optimization techniques, such as optimistic synchronization, enable high performance simulations. Special features, e.g. traffic lights, roadside stations, and CAM and DENM transmissions, are supported by VSimRTI. Moreover, various configuration, visualization and analysis tools assure maximum usability. 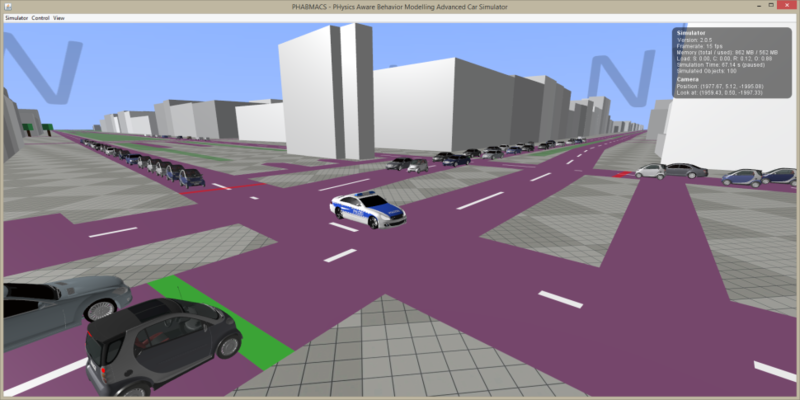 The Submicroscopic vehicle simulator Phabmacs (PHysics Aware Behavior Modeling Advanced Car Simulator) complements the microscopic traffic simulation of VSimRTI with detailed vehicle models, which realize the physical characteristics of vehicles. Modern vehicles include more and more driver assistance systems, which support the driver in certain situations. Simultaneously, the tasks fulfilled by such systems get more sophisticated. Accordingly, the complexity of such Advanced Driver Assistance Systems (ADAS) rises, which leads to an increased amount of time needed for development and testing. Testing of ADAS is done with specialized test vehicles. However, the hardware as well as the test execution are very expensive. A promising approach to reduce costs and time consumption for testing is to use a vehicle simulator during early development and for testing of prototypic ADAS. 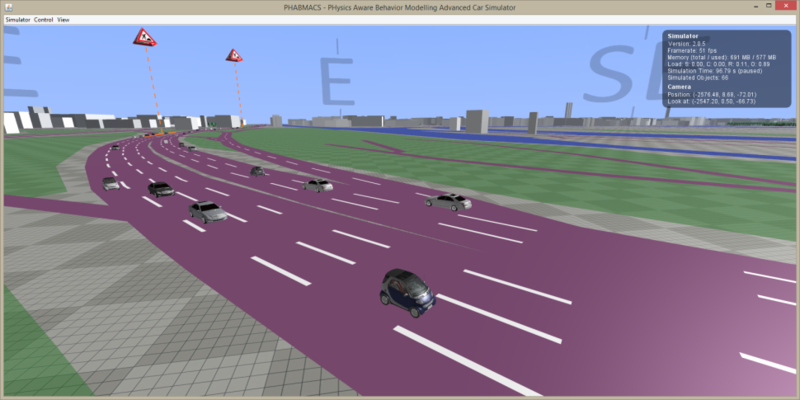 The Physics Aware Behavior Modelling Advanced Car Simulator (PHABMACS) provides a sophisticated framework for testing ADAS within a simulated environment. Vehicles are simulated with advanced simulation models providing them with realistic driving dynamics within normal traffic situations. Tested ADAS can utilize simulated sensor data as well as control simulated vehicles by using virtual actuators. When developing PHABMACS the requirements for the simulation of cooperative ADAS were always kept in mind. 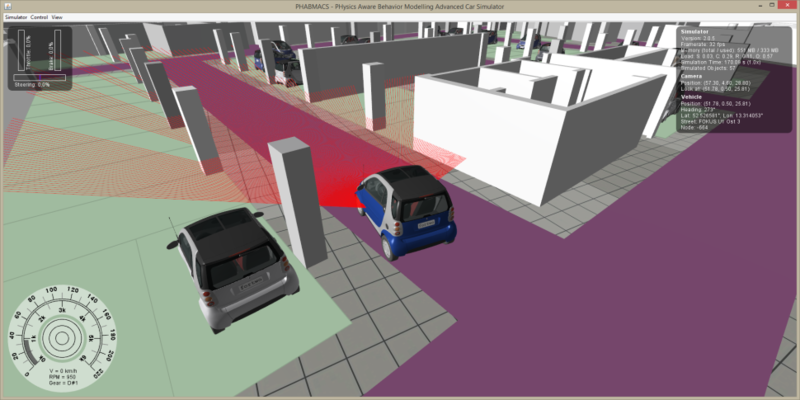 To simulate cooperative ADAS, like, for example, Cooperative Adaptive Cruise Control (CACC), a higher physics accuracy than any existing microscopic traffic simulator can offer is needed. Simulation scenarios contain fewer vehicles than large scale traffic simulations but can still involve hundreds of vehicles. However, in contrast to driving dynamics related driver assistance systems like ESP, cooperative ADAS only work in normal traffic simulations, a correctly simulated vehicle behavior in border situations like heavy over- or understeer is not strictly needed. Moreover, for validation, a deterministic reproducible simulation is needed. Finally the PHABMACS framework offers a Visualizer component for realtime visualization of the simulation using advanced OpenGL based 3D graphics.